If you need a little help hunting eggs, this Egg Box can help! 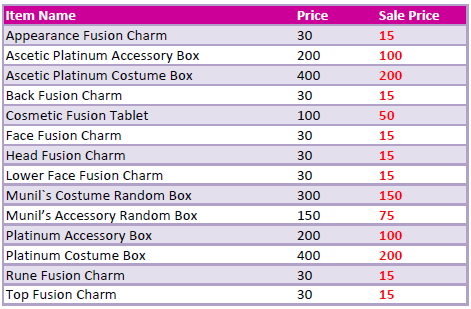 From April 2 to April 9, enjoy huge savings on costumes and fusion items! The smell of fresh blossoms can only mean one thing, it's time for the Spring Festival. That's right, fuzzy bunnies are hopping their way into Rune-Midgarts to share in the festivities. It's time to collect eggs and finish some Khara Quests! To get started you will need to find NPC Clinkz in front of the Prontera Fountain. Keep in mind that you need to be level 15 to start the quest. For a quest guide, please click here. also why no bug fixes or change notices? some people apreciate them and are good for decicions in builds or what char to use etc, kinda lame trying every char to see if have any change, also what is the new max number of characters? Edited by 1131131129203649980, 02 April 2018 - 05:18 PM. Right-clicking a bunny will either give you a Bunny with a higher level or a Sulky Bunny. You can also purchase the Easter Bunny Box selling in the Kafra Shop for 30 points. 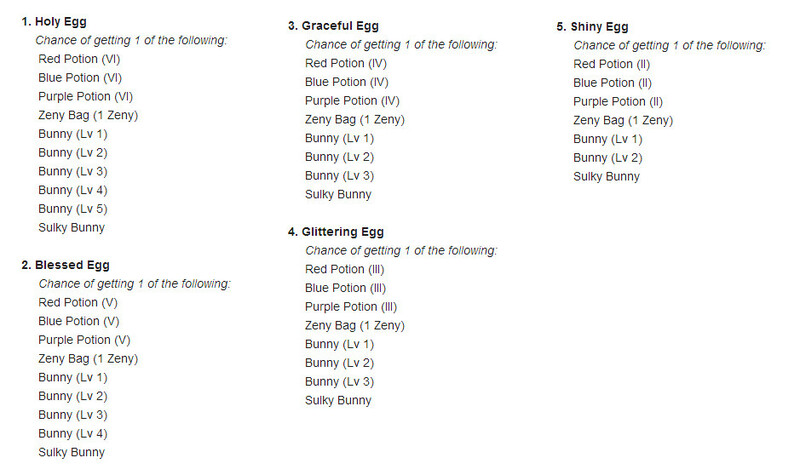 If you get a Bunny (Lv 10), then you will be able to complete the "[Spring Festival] Easter Bunny" Khara quest which gives a Easter Bunny Khara Title (2% Additional Damage, 2% Additional AGI, +30 Penetration, 1% Damage Reduction). Edited by 1131131129203649980, 02 April 2018 - 07:26 PM. Edited by 1131131129203649980, 02 April 2018 - 08:55 PM. Just wondering if there are any server issues right now. I wasn't able to log on and it told me there was a patch error. I sent in a ticket, but I'm just checking in here too. can we get the same drop as cacao or snowflakes? Edited by 1131131129203649980, 03 April 2018 - 06:20 PM. well, if you have issue about "can not connect to patch server", you can try to find "MD5FileList.txt" inside your ro2 folder. if the folder doesn't appear try running patch first, >> open MD5FileList.txt using notepad and deleted the text inside the file, then save, and deleted other MD5File contect in your ro2 folder except txt file >> then right-click MD5FileList.txt and tick "Read Only". and press OK. and try run your client again. i think better like that, since it's fun to adds a bit of a challenge to looking for it. and also to make a good price at market in-game. if they change the current drop, that will make other players will use the macro for farming. "Don't be lazy if you want it"
i get it but i dont care the tittle myself as im an old player and have lots of chars. i just think on new people (that there is a lot these last months) that most of them have 1 char and have a hard time finding pt to kill prank. my point is, why not have more daily quest so 1 character can get the enoght eggs beetween pure and blessed eggs to get one tittle in 15 or 10 days? well, agree with that.. nice to add more dailies.